I am wondering if my Betta (male) made a bubble nest or maybe they are just bubbles I'm not sure. I attached a couple pictures of it. Also is my Betta setup an ok one? Its an 5 gallon plastic container with a plant. I change the water 2 times a week is this setup ok for him. It does not have a filter or heater but I have a big heater in my room and keep it around 75* F.
<This is too cold. He needs a heater, both for warmth and to keep the temperature steady. In a small volume such as this, water temperature will fluctuate quickly, which will stress him. 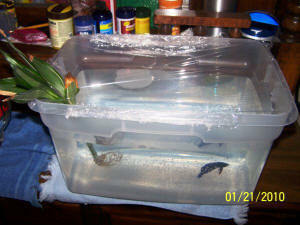 Also, since Bettas are air breathers, I would use something other than plastic wrap to cover this vessel. Chances are small that he will "run out" of oxygen, but this air must get pretty stale. In addition, with no filter, there is little chance of biological filtration, i.e., the nitrogen cycle, ever occurring. 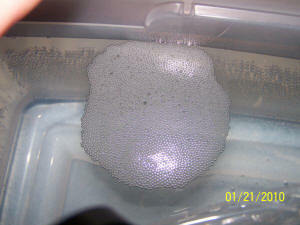 This means that each time you change his water, the ammonia concentration will climb until you change the water again. He's going to be sitting in his own toxic waste products for a good five days out of the week, at least -- the only time the water will be clean for him are the days you change it! And please read here for information on the nitrogen cycle. Filters have several functions, and one of them is to allow space for bacteria to grow in order to facilitate the processing of toxic waste products into a much less-toxic product. This is how fishkeepers get by with small weekly water changes, and these small water changes make for a more stable environment for the fish, reducing stress. I think the results of keeping Bettas too cold and in unfiltered bowls will become abundantly clear after a quick perusal of the archived queries on WWM. If you have any further questions after reading, please feel free to write back. Female Betta in Heat: Does this explain the mood swings? Hello. 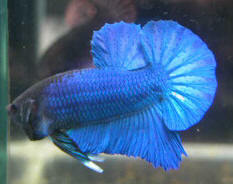 My name is Marie and I have recently bought a female beta. <Hello, Mike G with you tonight.> We have her in a tank with several other fish and seems to be fine, other than a little shy. <To be expected.> We caught her having problems with only one fish, which she chased around and, we think, nibbled on her tail. The fish that she was chasing around died and she seems to be fine with the others, even ones of the same breed that, we believe, she might have killed. <I don't quite follow you. She seems fine with the others, including the ones of the same breed that she killed (or might have)? In any case, she sounds like a rowdy one. I'd separate her if it were up to me.> Is that normal? 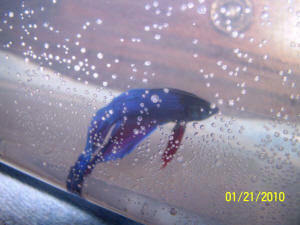 <Bettas are unpredictable fish in terms of temperament. Yes, it is normal, but only in certain individual fish.> Also, do female bettas secrete a cloudy discharge when in heat? <No.> It is all over the bottom of the tank and I have no idea what it is. <Could be one of many things.> I'm an amateur when it comes to fish and it would help a lot if you could tell me. Thank you very much. <I am glad I could assist. Best of luck, Mike G.> Marie. Female Betta body color Hi Chuck, I have a question about by female Betta. She is active (swims fine), eats well, but her body is mostly a gray with black strips most of the time, her true body color is blue. Her fins seem normal (red with some blue). I tried to maintain a water temperature of 70, and add some salt for tropical/goldfish fishes. The water is heated with a lamp, and the water is not filtered, I am not sure of the PH count. One morning when I went to check up on her she was a pale color (body and fins) and motionless, usually when she see me she will come to the front waiting to be feed. But this time she stayed motionless for some time, I put some food, but she would not move. I left the room, and when I returned she was at the top and had eaten your food. Now she seems fine (swimming/eating), but her body color concerns me. Is the body color change a sign of sickness, should I get some medication ? If so can I mix the medication with the salt. I started using salt just recently ? Is the salt good enough to kill any bacteria ? < Bettas prefer a water temp of around 80 F not 70. The striped pattern is normal for young Bettas or Bettas not ready to breed. Medications are not needed at this time.-Chuck> Thanks, Mario D.
Betta's right gill does not close properly like its left one Hi Chuck, I am babysitting my friends male Betta, I observed him for a few minutes, he is generally a quit fish hardly swims, usually hangs around the top or bottom of his jar, he did not shadow dance or make any bubble nests during my observation, but in general looked quite healthy. I changed his water (100%), I used untreated tip water that I have sitting for a couple of days to remove the chlorine in the water (in Montreal, Canada I was told, the water is only treated with chlorine) and added some aquarium salt, at a water temperature just above 70. I put him next to my other Bettas (a male and a female) all in separate jars, his activity level increased, and flaring with a passion. Later in the day I went in to check on them, and I notice that my friends Betta right gill does not close (stays open slightly) than his left side (completely close). It was not noticeable when I brought him home or after I changed his water, nor during my observation before I left the room, since his upper body and face is a red color, I do not notice any unusual redness near the open gill (slightly). He seems to be eating all that I feed him, and he seems to be swimming around some what, and he still seems to flare. I put a piece of paper to block their vision, but at times he still flares in their directions and my female or male will do the same if they see him. How can I tell, if the open gill is cause him any pain? Is it causing him any pain or discomfort? Could all that flaring inflamed one side of his gill? Is it inflammation? Should I treat it now or take a wait and see approach? What medication should I use? < Sounds like the male may have overextended one of his gill flaps during a display ritual. Look at him closely and see if there is anything that is physically causing the gill from completely closing. If you don't see anything then I would wait and see if it gets worse before I would use any medication.-Chuck> Thanks, Mario D.
Betta's right gill does not close properly like its left one Thanks Chuck. I appreciate you sharing your time and knowledge. Can you further explain what you mean by "... see if there is anything that is physically causing the gill from completely closing ...", < The gill cover is basically liker a valve or gasket. If the gasket does not seal completely it may be caused by something in the way that prevents it from closing completely. There may be a parasite like a gill fluke that extends beyond the gill opening and prevents it from closing all the way.> and what signs should I look for when you say "... wait and see if it gets worse ..." < If it is a parasite then they will be breeding and the gill opening may be getting bigger instead of getting smaller If it is damaged then it may heal on its own and require no treatment at all.> Could his gill have gotten inquired while I was changing his water, his head could of hit the glass when I poured him into a temporary jar. I remember, he was move quite a bit inside the net (his gill could have tangled with the net) or when he fell out of the net and hit his head/body on the sink, I had to scoop him back into the net and placed him into the clean water, this process could have caused his gill to bruise or inflame. <Any sort of physical trauma that you describe may have caused the damage. No treatment is needed unless it gets infected.-Chuck> Thanks again, Mario D.
Betta's right gill does not flare properly Hi Chuck, I kept monitoring his condition since my last email to you, and his right gill seem to have gone back into place, when I compare with his left side (Read below for some background). But, I recently started noticing that when I flares, he has trouble opening his right gill. He left side will completely open, but right side won't or will open just a little. < Once again this may be caused by trauma to the area. If there are no other symptoms then I would suggest that it be left alone for awhile.> There does not seem to be any blockage or discoloration on his gill, he looks fine, eating well, building a nest, and swimming fine. What is Methylene Blue? < This is a dye often used to stain microscopic organisms before they are viewed under a microscope. It does have some antifungal and anti bacterial properties.> Can it be used after each water change to keep the Betta healthy? < I do not recommend any medication to be used as a preventative because the disease organisms end up becoming immune to the medication over time.> I do a 100% water change every 3 days. Use Tip water that has been sitting for at least 3 days (In MontrÃƒÂ©al, Canada) I was told our water only contains Chlorine, and by adding a drop (Methylene Blue) would it keep the water clean and healthy. < A drop won't hurt but it won't help much either.> I already add some aquarium salt after each change is that enough? < I little salt is a good idea because it makes the fish create a slime coat that keeps organisms off the skin and gills.> Can you provide me with some advice. < Try a good water conditioner instead like Amquel by Kordon or Ultimate. These will do a better job of removing harmful agents in the water.-Chuck> Thanks Again, Mario D.